...but only after a brief detour into Poland, of all places. 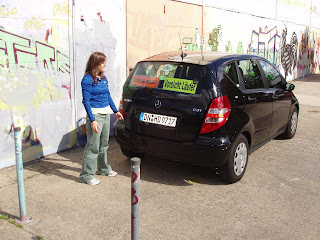 Diana & I met as planned - on time - in Berlin airport, picked up our rental car, and were doing oh so well navigating to the Baltic Sea town of Stralsund, when we realized that we were on a very bumpy road with no exits, and eventually a border crossing. A quick check of the map confirmed that we were incontravertibly entering Eastern Europe. After some grovelling apologies to bemused guards, we were given our passports back, and sent back from whence we'd come. Eventually we reached Stralsund, & met up with charming race director Ingo & my friend Hiroko from Transe Gaule. Diana snapped some photos, & I'll post them online as soon as we can get our technology to cooperate. So glad ya'll made it! Good Luck!! Nothing like a little excitement to mix it up a bit. It does make a good story : ) It must be so great to reunite with some of your friends from France and meet new crazy (oops I mean ultra) runners. I'm so glad that you have Donna to help you out this time. Should I be offended that you say "Poland...of all places??"